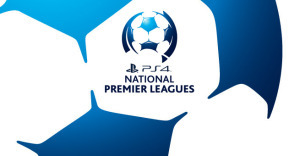 Broadmeadow Magic and Edgeworth Eagles contested a cracking affair at Magic Park in the Northern NSW PlayStation® 4 National Premier Leagues (PS4 NPL) Round 11 Match of the Round yesterday afternoon. Many viewed this match as the unofficial State Cup Final after both sides qualified for the Westfield FFA Cup Round of 32 the weekend prior, and it was a match worthy of a final as both teams played with intensity and composure in an intriguing 90 minutes of football. Both sides were welcoming back their captains as Peter Haynes returned to PS4 NPL action after missing the Olympic derby, and Luke Walker played his first game in 2015 for the Eagles. Edgeworth had the first major chance in the game when they were awarded a penalty after Josh Piddington collected Keanu Moore in the box. Bren Hammel’s shot from the spot was destined for the bottom right hand corner, however Magic keeper Nathan Archbold brilliantly saved the shot with an outstretched glove. Archbold could not deny the visitors eight minutes later however, as an unmarked Moore picked up a poor clearance just inside the 18 yard box following a corner, and buried a left footed shot into the bottom left hand corner. Magic replied almost immediately as Ben Higgins pounced on a loose ball following a corner of their own, driving it past a number of bodies into the back of Jim Fogarty’s net. Dino Fajkovic had a brilliant chance to put the home side ahead in the 36th minute when he ran onto a Josh Piddington through ball, however Fogarty stood strong outside of his 18 yard box, denying Magic the lead with his chest. A clash with Scott Petit during an aerial contest just before the half time break saw Fogarty forced from the field with a shoulder injury, substituted by Eagles veteran Ben Smith. The sides took the 1-1 score line into the break after a quality half of football. The second half saw many chances created however both sides’ defence were extremely resilient. Ben Higgins in particular was a standout for Broadmeadow at the back, blocking a number of important shots and making several crucial tackles. He and his backline were helpless in the 87th minute however, as Keanu Moore turned provider, finding Aaron McLaughlin with a superb through ball who charged into the box and buried a shot into the bottom right hand corner to give the Eagles a 2-1 win. It turned out to be a valuable three points for Edgeworth. Adamstown held leaders Hamilton to a 2-2 draw, therefore Edgeworth (24 points) narrowed the gap between them and Olympic (25 points) at the top of the ladder to juts one point. The loss sees Broadmeadow move four points outside the top four after Lambton and Weston both enjoyed wins in Round 11. Next week Edgeworth are involved in another Match of the Round when they host Hamilton in a top of the table clash. Magic are also at home where they take on Charlestown. Both games are on Sunday afternoon. In a huge clash that could be labeled the second Match of the Round for Round 11, Hamilton Olympic welcomed Adamstown Rosebud to Darling Street Oval. The Rosebud entered the match depleted, missing a number of first grade players, most notably Garry Kenneth who has been ruled out for the remainder of the 2015 season. Hamilton Olympic have been in hot form this season, undefeated and having won their last five matches going into this one, and it was they who struck first as Jacob Bailey put the home side ahead just after the half hour mark. Scott Carter under hit a clearance at the edge of his 18 yard box that fell to Bailey 35 metres out, who shot first time, lobbing Carter and making the score 1-0. Adamstown hit back just a minute before half time as Nick Bale scored to send the sides into half time locked at 1-1. Rhys Cooper put the home side back in the lead on the hour mark, receiving a pass from Kane Goodchild, turning, then slotting a well placed shot past Carter. Just like they did in the first half the Buds refused to give up, and they equalised in the 75th minute after a Matt Paul swinging corner ended up in the back of the net, coming off the head of Matt Harper. The score remained 2-2 at the full time whistle, with the sides forced to share the points. Hamilton coach Mick Bolch said that his side had performed far better throughout the season, and suggested that they were slightly rusty after a week off. ‘We were pretty flat today, the week off didn’t really help us at all,’ he said. ‘I thought the second half was fairly even, but at the end of the day we need to be a lot better next week when we play Edgeworth’. ‘Adamstown played to their game plan and to their credit they did very well. Matt Paul was very good today, in fact all three of their front line, including Nick Bale and Travis Cooper, did a good job’. Adamstown coach Graham Law was impressed by both the performance of his side as well as the players’ attitudes. ‘We played brilliantly, especially considering we had to adapt to a new side,’ he said. ‘After we lost Guy Bates we went on to win four out of five, and now after losing Garry Kenneth for the season we go out and give the leaders a real good run which is very positive’. The draw keeps Hamilton at the top of the table, and takes Adamstown to within a point of fifth placed Broadmeadow as they still sit in sixth. Next weekend Hamilton are away in the top of the table Match of the Round against Edgeworth, and Adamstown host Charlestown, both on Sunday afternoon. The third match of Round 11 in the PS4 NPL saw the Newcastle Jets Youth travel to Maitland to take on the Magpies in a must win game for both sides. Maitland required a win to keep their slim hopes of making the finals alive, but more importantly to move away from Charlestown and South Cardiff in the relegation battle. The Jets had lost their last five in a row so a win was certainly needed to get their season back on track after a positive start in the opening five weeks. The Jets dominated possession in the first half, however Maitland produced the better of the chances. Late in the first half it was still locked at 0-0, until Matt Thompson stood up for the home side, and put them ahead with a quality finish. Maitland took the 1-0 lead into the break, with both sides aware that the match was anything but over. The forced substitutions of Chris Broadley with a hamstring injury and Jye Mackellar with sickness threatened to derail the match for the home side, however they stood strong and executed their game plan as a unit, and saw out the match winning 1-0, picking up a valuable three points in the process. Reece Thompson was proud of his side’s execution and determination for the full 90 minutes. ‘We had a game plan and stuck to it and it worked well,’ he said. ‘The Jets had the majority of possession but failed to create any clear cut chances. We sat back and let them keep the ball but when we won it we looked dangerous’. ‘To be fair they probably had 70 percent of possession in the first half but we could have been 3-0 up’. ‘At half time we spoke about keeping focus and discipline in holding the shape. The whole team showed plenty of character’. The result sees Maitland join the Jets Youth on ten points. The Jets are ahead by goal difference so they remain seventh, whilst Maitland remains in eighth. The positive for them is that they move five points away from the bottom of the table. The Magpies face a huge task next week on Sunday afternoon as they face a Broadmeadow side who beat them 5-1 earlier in the season, and are looking for their first win in five games. The Jets Youth play on Saturday afternoon when they tackle the South Cardiff Gunners at Ulinga Oval. Charlestown City hosted Lambton Jaffas yesterday afternoon in a vital match for both sides at Lisle Carr Oval. Charlestown have been battling at the bottom of the table for the majority of the season, so three points would take them possibly four points clear of tenth position. The Jaffas have recently entered the top four, and are on a very good run, so a win was important to continue their form and see them stay in the top four for another week. The away side started the better of the two sides, going ahead from the spot as Riley McNaughton calmly converted a penalty that he won himself. Lambton looked strong in the first half but could not find another goal, taking the 1-0 lead into the break, leaving the match wide open and there for the taking for both sides. 20 minutes into the second half it was Lambton who doubled their advantage, as Luke Remington scored following a great run down the left hand side. The Jaffas then scored again, however this time it was into their own net, as Michael Sessions miskicked a clearance that ended up beating Brad Swancott and finding the Jaffas net to make the score 2-1. Michael Bridges restored the two goal lead, making the score 3-1 after he finished off a great cross from McNaughton. 3-1 is how the score stayed, with the Jaffas retaining their fourth place spot, moving four clear of fifth placed Broadmeadow Magic. Jaffas coach David Tanchevski has been inspired by his side’s performances in recent weeks, but knows the big challenge is yet to come. ‘We played well today I thought. We certainly could have won by more, but their keeper had a great game, stopping four or five shots that should have been goals,’ he said. ‘Riley McNaughton picked up our players’ player award today, which he deserved after an awesome performance’. ‘We are on a very good run at the moment, but we have a hard task in the next four games. We have the three teams above us and Broadmeadow who are one below so it is going to be a hard challenge’. Next week they begin that four week run against Weston in the Grand Final rematch, at home on Saturday afternoon. Charlestown remains in second last after South Cardiff also lost in Round 11. Next week they are away to Adamstown, a huge assignment considering the Buds are undefeated in their last six matches. The final match of Round 11 of the PS4 NPL saw Weston Bears welcome South Cardiff to Rockwell Automation Park. Both sides went into the match missing a number of key players. The Bears were without James Monie, Rob Macbeth, Jamie Subat and Paul Clout, whereas the Gunners were still missing Dean Kelley, Matt Grey and Mitch Wallace. The sides both pushed hard in the opening half four the game’s first goal, however both defences, more importantly the keepers, Tom Pullin of South Cardiff and Tim Pratt of Weston, were doing a fine job of keeping their opposition at bay. The second half saw much of the same. Both sides were pushing for that crucial goal however neither could find it. That was until the 78th minute when Weston’s Troy Hearfield received a brilliant cross from Garry McDermott, and superbly placed it into the back of the Gunners’ net to make the score 1-0 to the home side. The Bears pushed on for another, and the Gunners searched desperately for an equaliser, however Hearfield’s strike turned out to be the difference between the two sides as Weston finished the match as 1-0 winners. Weston coach Trevor Morris was proud of his team’s performance, more importantly their drive and willingness to fight hard for the result. ‘We played well today as a team I thought,’ he said. ’South Cardiff fought really hard, and their keeper was sensational. We had to battle hard to get the three points, and we did so I was happy with that’. ‘Carl Thornton led well from the back today, and Tim Pratt was outstanding in goals, however our whole side played well and it was a great team victory’. Morris went on to say that although his side were in a great run of form that they would not be getting ahead of themselves and that the Bears will continue to take it one game at a time and treat all opponents with respect, as 2015 is an extremely tough competition. The win keeps the Bears in third position, and after Hamilton’s draw they are now just three points behind the league leaders. Next weekend they take on the fourth placed Lambton Jaffas on Saturday afternoon at Arthur Edden Oval in the Grand Final rematch. The Gunners remain in bottom spot following the loss, and have now lost seven in a row. Next weekend they take on the Newcastle Jets Youth who have lost six in a row, at home on Saturday afternoon.